Ben Brandzel, international online organiser who builds progressive grassroots power and currently runs campaigns for President Obama's politcal arm, on how progressives can use online organising to create real change, and why they should. Far from ‘clicktivism’, good online organising is an indispensable key to unlocking serious people-power in the 21st century. Last Thursday, an article ran in Comment is Free decrying the dangers of online organising, or what the author, Mr Micah White, misrepresents as ‘clicktivism’. This critique deserves a careful response. It seems fair to say that Mr White and most Comment is Free readers share a commitment to shaping a more humane, sustainable and peaceful world. This debate is important because good online organising offers a powerful and fundamentally democratic tool for achieving that vision. Though only one tool of many, online organizing is not one we on the left can afford to abandon – and it is one that any progressive should be proud to embrace. First, we should be clear about what ‘online organising’ actually means, and it is simply this: people collaborating over the internet to convert whatever resources we can spare into social, economic and political change. These resources include our opinions, votes, time, relationships, material goods, and creative talent. Most large scale online organising does indeed start by sending out mass emails and asking supporters to click on some links. That’s how the internet works. But to therefore reduce the activity of the millions of grassroots activists in groups like MoveOn or the UK’s 38 Degrees to mere ‘clicking’ is akin to saying that writers merely scratch at random with their pen, doctors merely tap on their stethoscope, and fire fighters merely play around with their hose. The value of any tool is only clear when one understands the context, purpose and affect; and while all online organising tactics start on the internet, every good tactic ends with offline, real-world impact. It is true that sometimes bad online organising comes along and doesn’t make the leap. 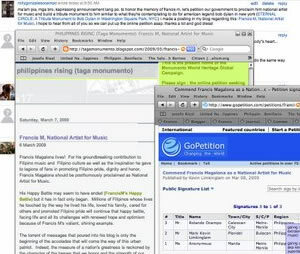 An online petition which remains locked in a database, or is quietly emailed into a bureaucratic abyss, is at best a waste of time and at worst a nudge towards cynical disengagement – but to dismiss the explosive power of internet-fueled advocacy on that basis would be as disempowering and counter-productive as abandoning the idea of labor unions after a failed strike, or ignoring all elections because of one inept candidate. Instead, those committed to social change must strive to distinguish the good online organising from the bad, and then demand excellence wherever we can. So how does good online organising lead to real-world change? Most tactics can be roughly grouped into three major categories: speaking up, reaching out and working together. These categories are illustrated below with a range of quick stories from some of the world’s leading online organising outfits. Even the most basic device in digital organising, the online petition, enables millions of people to easily express an opinion to a public or private sector decision-maker. This is an essential act of citizenship, not to be sneered at. But do the petitions influence change? That depends on what you do with them. During the Bali, Indonesia, climate summit in December 2007, Japan sided with the USA and Canada to block a global agreement on 2020 carbon reduction targets. Avaaz, The global online organising network, collected more than 90,000 signatures overnight, and then ran an ad featuring the total in the Jakarta paper. Japan’s Asahi Shimbun newspaper later reported on a closed-door meeting in which prime minister Yasuo Fukuda was presented with the ad, and then shifted his stance, breaking the international deadlock. In the UK, consider the week of June 15th, 2009. That Monday, Gordon Brown announced that the long awaited inquiry into the Iraq war would be held in secret. A massive outcry followed, including an emergency online petition by the new group 38 Degrees. On Thursday, they arranged to hand deliver constituent signatures and comments to every MP’s Westminster mailbox. By the following Tuesday, No. 10 announced the inquiry would be public. Or this year, when BBC 6 Music faced extinction, nearly 45,000 38 Degrees members signed online in protest. Next, those same members funded billboards featuring the growing signature total outside BBC offices nationwide. The petition was then publicly handed over by the same artists who perform on the station. 6 Music is now alive and well. Of course, petitions are just the simplest of many ways good online organising can concentrate grassroots pressure on key decision makers. This year in the United States, online supporters of Barack Obama’s Organizing for America flooded Congress with more than 1.5 million constituent calls – beating back a $400 million industry lobbying onslaught to finally pass universal health care. In Australia in early 2008, nearly 20,000 online members of GetUp joined together as customers of ANZ Bank, demanding that ANZ pull funding for the construction of a new ultra-polluting paper mill. The bank caved, and the construction was cancelled. Back in 2005, MoveOn’s online tools connected outraged constituents with congressional town hall meetings across the United States. This voter revolt torpedoed President Bush’s attempt to privatise social security, saving millions of American pensioners from certain poverty. In the 2006 midterm elections, MoveOn members made more than seven million voter turn-out calls to progressives in swing districts, helping to end a decade of Republican dominance in Washington. In the summer of 2005, the bereaved mother of a fallen soldier kept a lone vigil outside George W Bush’s Texas ranch. Thanks to online organising, more than 200,000 MoveOn members and other progressives held local solidarity rallies across the nation, reinvigorating the flagging anti-war movement at a critical time. In January of 2008 in Australia, thousands of GetUp members hosted and attended ‘Reconciliation Get Togethers’ where indigenous and white Australians could speak face to face, many for the first time in their lives. They formed plans to tackle injustice and began to heal this terrible rift in Australian society. MoveOn members have organised hundreds of local leadership councils across the United States, which recruit volunteers, draft local plans and organise neighbourhood events. Thousands of folks of all ages have gotten their first taste of community activism and public leadership from these MoveOn Councils. Most would never have gotten involved if the first step had been more intimidating than an online signature. And let’s not forget the small donor revolution. We’ve all heard how the insurgent Barack Obama became a viable candidate and then won the presidency because he raised nearly $500 million online. But rapidly pooling our resources goes far beyond winning elections. In 2005, MoveOn members opened their homes to more than 30,000 gulf coast residents fleeing the ravages of hurricane Katrina. Beyond the immediate relief, new friendships were forged that bridged cultural, racial and economic divides, helping to tie the nation closer together. In October 2008, Avaaz members contributed more than $350,000 dollars in less than four days to provide satellite phones to Burmese monks and democracy activists fleeing Rangoon. This established a vital, uncensored channel to report the abuses of the ruling junta. And just this week, GetUp members funded a successful court battle to allow online enrollment for the Australian electoral register, extending a meaningful franchise to countless young and rural citizens. These stories help to illustrate what we can accomplish with good online organizing – and it’s just the beginning. People ARE the power: The only influence these online networks wield is a direct function of supporter participation. If the supporters don’t sign, call, show up, donate etc. the campaign is nothing. This forces organisational leadership to be genuinely responsive and puts power where it belongs – in the hands of millions of real people. This is why detailed response metrics matter so much to online organizers: they are the best way to tell if the organisation’s causes and tactics are actually matching what the supporters want to do. It’s not about soulless marketing; it’s about actually listening. Accessible activism: The fact that online organising allows people to convert a small amount of time into a small amount of change doesn’t close off channels for deeper involvement – but it does open up activism to the countless millions of people who work for a living, tend to their families, and don’t have time on most days for anything else. These people deserve the opportunity to influence society as much as the fortunate members of the leisure class. Objections to this from old-school, professional activists are no different in principle than objections from big donors who are annoyed that now any old person with five quid to spare can influence elections. It is certainly worth noting that internet based activism is not available to those on the other side of the digital divide. This is a serious problem. It is one of the many reasons why online organising must always complement and never replace traditional organising. But the imperative to shrink the digital divide is not an argument for abandoning the grassroots power the internet provides. Accessible leadership: The essential tools to begin online organising are available free or cheap to anyone with basic computer skills. Now almost anyone with a cause, a plan and some time to spare can try their hand at leadership. If they strike a chord, massive growth and legitimacy no longer requires the blessing of a foundation, publishing house or major donor. This enables, rather than restricts, the rise of new and radical ideas and constituencies. But it also forces would-be leaders to win genuine popular support if they hope to wield genuine popular influence. And that’s how it should be. Moments become movements: Online organising is uniquely equipped to easily transform the energy released in a sudden moment of outrage into a sustained movement for change. Just imagine if the two million anti-war marchers who filled the streets of London in 2003 had all signed an online petition to supplement their real-world signs. Yes, Tony Blair may well have still waged that war. But two million progressive Britons would have then been just one email away from easily collaborating on the next great opportunity for change. And the next. And the next. Governments and corporations have structures that automatically preserve their learned lessons and accumulate their assets, thus constantly building their aggregate power in society. We the people deserve to have the same. The critique in last week’s article focuses largely on the notion that online organising is based on an “uncritical embrace of market ideology”. This is true in one sense only: good online organisers understand that activism must compete in a highly competitive market place for the time and attention of potential supporters. This is modern reality, and it is not going away. We progressives cannot treat freedom of choice as our enemy. We cannot wait for the sheer force of our private convictions to compel public ascent. Rather, we must always make an authentic, persuasive case for why principled people can and should act in a particular way at a particular time to achieve a shared goal. And we must offer the tools to do so, in a format that is compatible with people’s daily lives. The moment we stop doing so, we disempower those who seek to band together for the common good, and give way to the predations of those who only seek private gain. So for the sake of the change we believe in, and the people-power we need to make it happen, let’s hold online organising to a high and rigorous standard, and then proudly make the best of it as an essential tool in paving the path towards justice. The author is neither inexperienced nor unbiased on this topic. He is a frequent writer, trainer, and practitioner of online organizing, having held senior positions at MoveOn, GetUp, Avaaz, and President Obama’s Organizing for America. He served as chief founding adviser for the UK’s 38 Degrees. RT @jilliancyork: "The case for online organising | Left Foot Forward" ( http://bit.ly/d82Y29 ) It's here, it works, use it. Great article, except for the fact that there is no mention of 350.org. Their almost entirely web-based organizing model led to over 5,000 events calling for action to stop climate change in more than 180 countries on October 24th, 2009. If this doesn’t show the power of online-to-offline organizing, I don’t know what does.